Here’s a story with a happy ending. Don Wilkinson was made redundant at the tender age of fifty three (my age). Since then he’s spent seventeen years cruising the canal and river network on his own boat. He’s still cruising and still enjoying every minute of it. I am a 70year old male Don Wilkinson. No significant other or pets. ie Single handed boater. boat and live on it cruising the canals. Luckily I got made redundant at age 53 and have been happy ever since. Vespa scooter and sidecar. For the last few years it has held an electric mobility scooter plus junk I don`t want in the boat. The name was on the second hand boat I had 10 happy years on. Rather than pay a signwriter to put the name on I invested in a pair of cast aluminium nameplates. When I got my new boat 7 years ago I transferred the nameplates. My boat is 57 feet long by 6ft 10″. She is a narrowboat but with a fixed wheelhouse putting my air-draft up to 6ft 6″. This prevents me transiting the tunnel on the Huddersfield narrow canal as their max height is 6ft 2″. When I asked about putting 45 gall drums of water on the back deck to get the air draft down BW said I would then be too deep. ( I normally draw 3ft 2″). So far on my travels this has been the only place I could not access although I do often touch bottom while cruising. Luckily by being made redundant the Redundancy pay plus a lump sum payment from my pension enabled me to buy my first vessel for cash without having to sell my bungalow in Kingston upon Hull. Renting this out has replaced the pension I lost by leaving work so early. Using all my savings, max out 2 credit cards and selling the old boat financed the new one. I have slept off the boat about 6 times in 17 years when visiting friends, and changing the tenant in the bungalow. People on “posh” cruisers looking down on me. eg. Last year on the River Thames 4 big cruisers on a visitor mooring with about 30 ft between them. When I approached the owner of the last vessel I asked if he would mind moving closer to the boat ahead of him so that I could moor up astern of him. His answer- I have already washed my hands ready for dinner. When I offered to move it for him he went a funny colour and used language I am not prepared to repeat. I found another mooring. 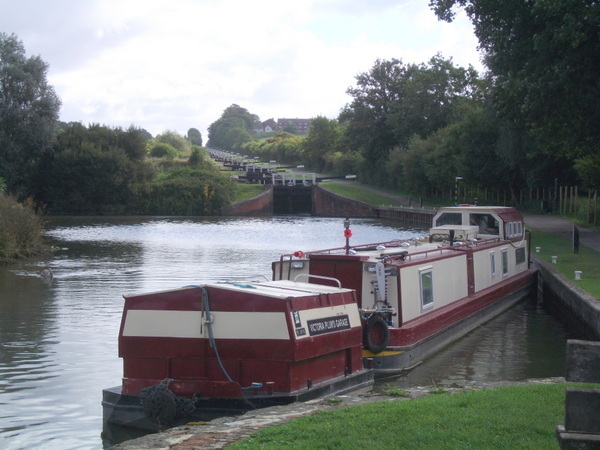 Meeting such lovely people on narrowboats, offering advice or just a chat, helping where needed. Also being able to have a different view out the window each time I do the washing up!! Reduce the draft so I would spend less time rubbing the bottom of the cut. If I can`t moor directly outside or within a couple of hundred yards of a supermarket the mobility scooter comes out. For a big shop I tow a shopping trolley. Alternatively use the bus pass. Full sized washer drier on board powered by a Travel Power 240 generator. A dongle from “3”. On a 4 month voyage to Bath last year there were maybe 6 nights when I got no service. Much better than the television reception!! My mobile is also with 3 which also gives good coverage throughout the country, so yes very happy. Difficult one to answer. I love most of them. If I have to choose just one it has to be the Llangollen. Second the village of Willington on the Trent & Mersey canal. I have a 45amp & 95 amp alternators feeding a charging system filling 5×120 ah domestic plus a 120ah engine start battery.Also I have a 3.5kw Travel Power which supplies the boat with mains power while the engine is running. Having a 240 volt fridge and 240 volt full size freezer, large microwave, big tv, disc players etc, plus a 240 volt lighting circuit usage is very high.I decided to go the mains route as I use a night time breathing machine due to sleep apnoea so have to use the inverter all night so saved money by buying big equipment 240 volt rather than 12 volt models. With hindsight I should have gone the 12volt route. Night time usage usually about 150amp hours takes about 3 to 4 hours engine running to fill batteries up again. At the marina I use electric radiators and are very happy with them. I have a Hurricane diesel heater feeding 6 radiators which I use while cruising. As the heater uses about 10 litres a day to heat the boat and a 25 gallon calorifier it is much cheaper to use electric heating whilst connected to the mains. Have a holiday on a boat during the early or late part of the year when the weather is cooler. If you enjoy the trip while it`s not bright sunshine then you are going to be delighted when it is. Don`t buy a boat to find cheap accommodation. You have to enjoy the views and wildlife. At last, a boat we’ve actually met on our travels. I think it was at Skipton in 2011. Victoria Plumbs Garage was definitely on the bank at Blue water when we spent the winter of 2011/12 there. Living retirement in the slow lane. 20 years hiring, 6 years of shared ownership and a Continuous Cruiser since 2007 but still learning! What sort of generator output do you need? Especially startup current. You will need to find out that information yourself. Where will you get the machine? The supplier will be able to tell you how much power it uses. Once you can let us know, forum members can advise you on a suitable generator. A slip of the finger I think. Should be CPAP machine. A quick Google shows that mosT machines ar 240 volt And 12 volt with the option of a rechargeable battery pack. This would mean a current consumption of lessvtgan 5 amps/60 watts. Given that you cannot run a generator between 8pm and 8am I would have thought the sensible way is to run it from the battery pack overnight and recharge during the day when the engine is running. However, not being conversant in the way these machines are used, I may be completely wrong. 220-240V~0.60A (1.65A max) 50-60Hz. Suitable for use with a DC inverter 200W min. My machine has a water container which means the air supply to the mask is moist to stop your throat and mouth drying up too much when using the machine. In use the machine sounds a bit like a quiet hoover cleaner a couple of feet from your ears. Takes some getting used to but much better than the alternative. Hope this helps, All the best with the treatment and the cruising. Hi re generator, you have not mentioned a battery management system, by using one you could easily up the charge rate into your service battery by allowing the spare capacity from your start alternator to be added to that of the service alternator. Doing this with your set up would still keep the charge threshold below the max, and with an Adverc System your batteries will get a proper three stage charge with a boost volt high at the end, just like modern alternator’s fitted to high end heavy electrical use cars. I live in North Carolina across the pond from you and have never set foot in the UK. Therefore I am not a narrowboat expert at all. I turn 70 later this year and have used a CPAP for about 7 years now. My doctor provides me with a ResMed brand CPAP and my insurance company pays the bill. I know that the insurance company has preferred that brand, and I just accept that. I only know this one brand. Mine is the newest CPAP, the S9. The newer S10 is actually VPAP and I have not tried it. Don’t want to; why mess with something which is working? It is possible to power a CPAP like mine from 12v DC (if you have a 12v socket in the bed area.) Perhaps this would help some of your readers. Our mains is 110 volt and I know yours is 230 or 240 or whatever. Yours is two phase while ours is one phase to ground (except for a select few appliances like an electric dryer that ends up 240 or whatever across phases). My experience is with ResMed and I get their newsletter. A recent subject was battery supply for operation on 12v. The battery ResMed sells for big bucks can only be charged in a wall outlet. They said if you don’t have access to wall socket power during your multi-night vacation, you should consider getting a marine battery, or a deep cycle, to power your CPAP machine. Like the boat domestic battery bank. Know how many hours of power you have. Humidification and CPAP pressure can both affect how much power your battery can provide. For instance, ResMed’s battery provides up to 13 hours of power. But with humidification on, it’s closer to 4 hours. I skipped the ResMed battery and bought a cheaper one with mains or 12v cigarette lighter socket or battery terminal alligator clips. That worked out to 6 hours at my actual settings this January when we lost mains for 45 hours. Then I switched to a car battery. That was for an S9 set to 11 (cm of water) with humidification (set 68 degrees) and a heated hose. 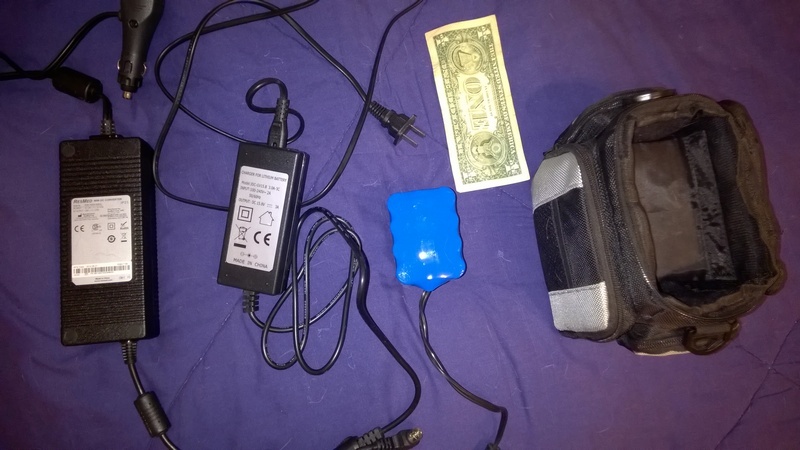 Converter to the left (ResMed), then the Mains wall charger for the off brand battery pack, then the battery pack (NiCAD bundle like a wad of AA batteries) and on the right the compact case (US dollar bill for size reference). The alligator clips were out of the picture, just clips and an attached 12v female socket. The battery pack has a female 12v socket which I also missed getting in the picture. This gave me 6 hours before quitting. Why? The humidifier was on. My next purchase will be a deep cycle battery. For you it is your boat domestic battery bank. Here is a portion of the battery guide for my unit with and without humidifier. 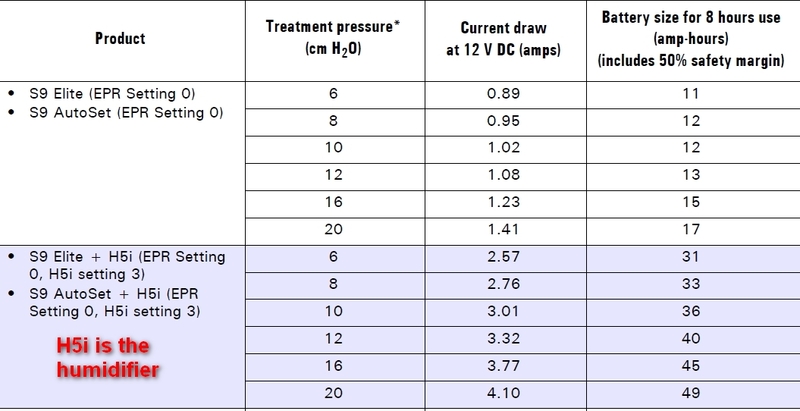 Looking at a nice 10 cm H2O you would need 12 ampere hours for 8 hours without a humidifier and 36 ampere hours with. So I need a way bigger battery. I learned the hard way. I did learn that converters were far more efficient than inverters for this use. Do you know the difference between a converter and an inverter. Me neither. I am curious, however. I suggest that you look at the ResMed battery guide as I found it interesting and it is all fact and not opinion. No selling in it.